Paving the Way: Ethiopia’s Youth on the Road to Sustainability transports viewers to an innovative development project in Ethiopia’s Gurage Zone where youth and their parents are working together to build a more sustainable future by connecting the dots between conservation, access to health care, and sustainable livelihoods. It is the final installment in the Wilson Center’s “Healthy People, Healthy Environment” trilogy, which explores integrated population, health, and environment (PHE) projects around the world. A co-production of the Woodrow Wilson Center and Think Out Loud Productions. 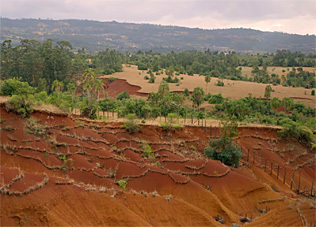 Filmed on location in the Gurage Zone, Ethiopia. 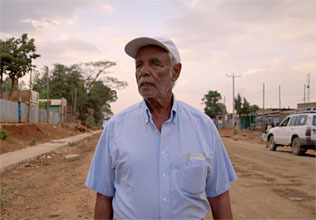 Tesema Merga was part of a vanguard of young Ethiopians who brought the first roads to the Gurage in the 1960s. He and others went on to form the Gurage People’s Self-help Development Organization (GPSDO). Today, Tesema and GPSDO are working with the next generation of local leaders to establish PHE clubs at local schools and encourage girls education and empowerment. Combining population, health, and environment programming seems natural to many people, but measuring the added value an integrated approach can be difficult. Ethiopia’s strong history of PHE programs has led to many different types of multi-sectoral evaluation. Resilience means different things to different people, says Roger-Mark De Souza in a Wilson Center podcast. But health is one of the highest priorities in many small communities like those in rural Ethiopia. Photos: Michael Miller and Sean Peoples/Wilson Center. Designer: Schuyler Null.